Last time we talked about the initial setup of the GR-700 for optimal performance. After the unit is set up properly, you're ready to start playing, right? Well, yes and no. Since the guitar synthesizer is not merely a guitar with effects added, consider some special playing techniques and pointers to help you get started using all the new features of the GR system to the fullest. Since the GR-700 system offers so many timbral possibilities, it would be a shame if it were only used to play the same things that would normally be played on an electric guitar. The truth of the matter is that some cliches played with new sounds just don't work. The Interaction of the sound patch and the musical setting must be considered. For instance, take a nice string-orchestral patch and play some "skanky' R'n'B-type seventh chords, or a take a clavinet-like sound and play a nice, full sustained chord. Doesn't sound too swift, does it? You have to tailor the sound and the musical context together. Here are a few rules-of-thumb to follow. Single-String Playing. While the GR-700 can keep up with fast runs, it will make little sense to play blisteringly fast licks where the Initial setting of the patch is slower than the fastest note; some notes will necessarily be missed because the sound takes longer to develop than the time allotted to it. If the release time is long, the GR-700 will prolong notes and run them Into succeeding notes, causing a probable clash and jumble. You will see that some of the new preprogrammed GR-700 memory cartridges from Roland have several attack and decay settings for the same timbral patch. It might be wise to set up three versions of each favorite sound of yours tailored for slow, medium, and fast playing. Sometimes if you use patches that change during the sustain section, playing too quickly also will hinder the desired effect. Since the GR-700 is programmable, you have a great degree of control and the ADSR settings should reflect the musical requirements. There is no formula to apply here, you must experiment to get the best results. When using settings that include two DCOs tuned to different notes, be aware that since the intervals produced are constant, there is the possibility of a clash with the background harmonies on certain notes. For example, if you tune your DCOs in perfect fifths and play a C-major scale, the note produced with the seventh degree B-natural is F-sharp, which can clash against a F-major chord, the IV chord in the key. This may be a desired effect, or, then again, it may not. This is no different from what a keyboard player must consider when he devises a solo patch. Octaves, of course, are always safe. Chords. While most people who play electric guitar rarely spend as much time thinking about the chords that they play as they do about the solos, when using a guitar synthesizer, the proper voicing of chords can make all the difference between the "right" sound and a "so-what" sound. The standard simple barre chords that are the staple of most accompaniments may not be appropriate with many of the patches you set up. Simply put: It isn't always necessary, or even desirable at times to play all six strings, and always using mot voicings can be boring. Break out those dusty old books on harmony! The use of the right inversion (remember what those are?) in the right musical setting can make the guitar synth produce sounds that are idiomatically correct. For an example, very rarely do arrangers write for strings using root voicings consistently. An arranger will usually use chord inversions which produce smoothly moving voices; the approach is that individual voices merge to produce chords. The guitar synthesist can take advantage of the sound of moving voices by considering the inversions used for a chord progression. Take a nice string-ensemble sound and play C, G, F, and G barre chords In succession (I, V, IV, V). Then play the same progression as follows: C root (C in bass), G first inversion (B in bass), F first inversion (A in bass), G root (G in bass). The second voicing of the progression produces a C-B-A-G descending figure in the bass which is closer to what a keyboard player or arranger would do. See figure I for the fingerings. 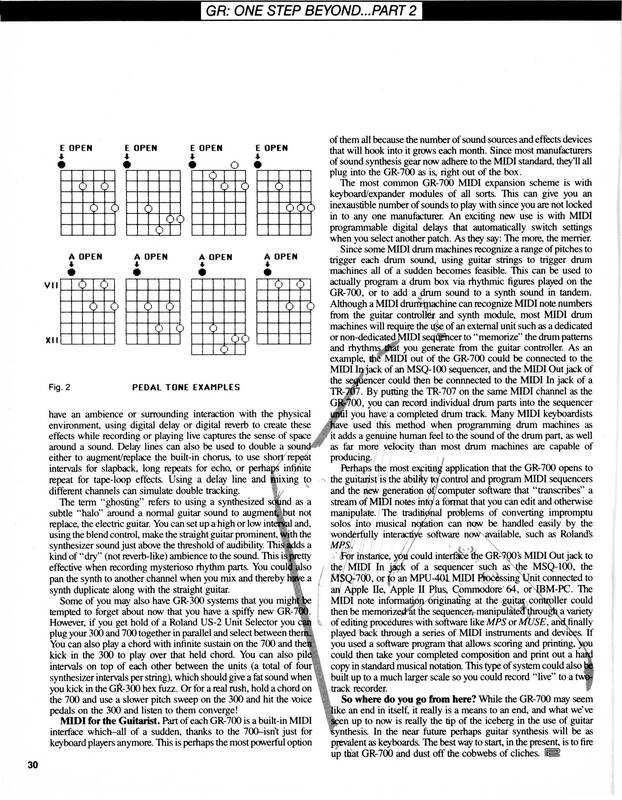 All this is not new--classical and jazz guitar players have been aware of this for years and their knowledge transfers very well into the guitar synthesizer context. The last point about chords is closely related to the use of DCOs tuned in intervals and single notes. If you have your GR-700 set up where two notes are played per voice (or string in this case), the more complex your harmony the easier it is for the synthesizer intervals and the notes to clash. So, for instance, if you have a sound of perfect fifths and you play a major seventh chord consisting of C, E, G, and B, the DCOs will produce pairs of C-G, E-B, G-D, and B-F# or C-E-G-B-D-F#, a major ninths, augmented eleventh (Maj9#11), a hip sound in and of itself, which may or may not be what you planned. Usually, triads, or even two-note Intervals with DCO intervals, can suffice with these settings. Pedal Tones. The programmable string hold feature in conjunction with the use of pedal tones and moving chord forms can also give you that orchestral effect. Since you can select which strings are affected by the hold pedal, you can play other things around them. You are no longer restricted to keys that have open strings available in the right range. Three- or four-note chords against a pedal are all that are needed to get the effect. 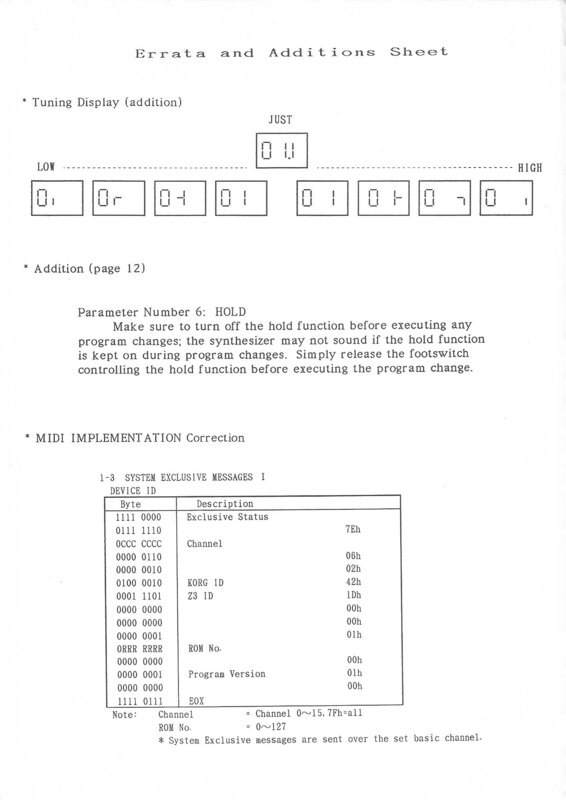 For the examples in figure 2, set the hold feature to work on the lower two strings only. While open strings are used for the pedal tones in figure 2, the GR-700 hold feature works for any note. Performance Tricks. While most of what you learn about the GR-700 will come from your own experiments and experience, a few little tricks will get you started in using the guitar synthesizer in some unexpected places. 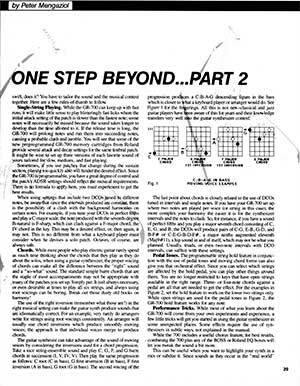 Some effects require the use of synthesizers in subtle ways, not explained in the manual. While the 700 includes a useful chorus feature, for best results, combining the 700 plus any of the BOSS or Roland EQ boxes will let you tweak the sound a bit more. This can be useful when you want to highlight your synth in a mix or subdue it. Since sounds as they occur in the "real world" have an ambience or surrounding interaction with the physical environment, using digital delay or digital reverb to create these effects while recording or playing live captures the sense of space around a sound. Delay lines can also be used to double a sound either to augment/replace the built-in chorus, to use short repeat intervals for snapback, long repeats for echo, or perhaps infinite repeat for tape-loop effects. Using a delay line and mixing to different channels can simulate double tracking. The term "ghosting" refers to using a synthesized sound as a subtle "halo" around a normal guitar sound to augment, but not replace, the electric guitar. You can set up a high or low interval and, using the blend control, make the straight guitar prominent, with the synthesizer sound just above the threshold of audibility. This adds a kind of "dry" (not reverb-like) ambience to the sound. This is petty effective when recording mysterioso rhythm parts You could also pan the synth to another channel when you mix and thereby have a synth duplicate along with the straight guitar. Some of you may also have GR-300 systems that you tempted to forget about now that you have a spiffy new GR-700. However, if you get hold of a Roland US-2 Unit Selector you can plug your 300 and 700 together in parallel and select between them. You can also play a chord with infinite sustain on the 700 and then kick in the 300 to play over that held chord. You can also pile intervals on top of each other between the units (a total of four synthesizer intervals per string), which should give a fat sound when you kick in the GR-3000 hex fuzz. Or for a real rush, hold a chord on the 700 and use a slower pitch sweep on the 300 and hit the voice pedals on the 300 and listen to them converge! MIDI for the Guitarist. Part of each GR-700 is a built-in MIDI Interface which all of a sudden, thanks to the 700 isn't just for keyboard players anymore. This is perhaps the most powerful option of them all because the number of sound sources and effects devices that will hook into it grows each month. Since most manufacturers of sound synthesis gear now adhere to the MIDI standard, they'll all plug into the GR-700 as is, right out of the box. The most common GR-700 MIDI expansion scheme is with keyboard/expander modules of all sorts. 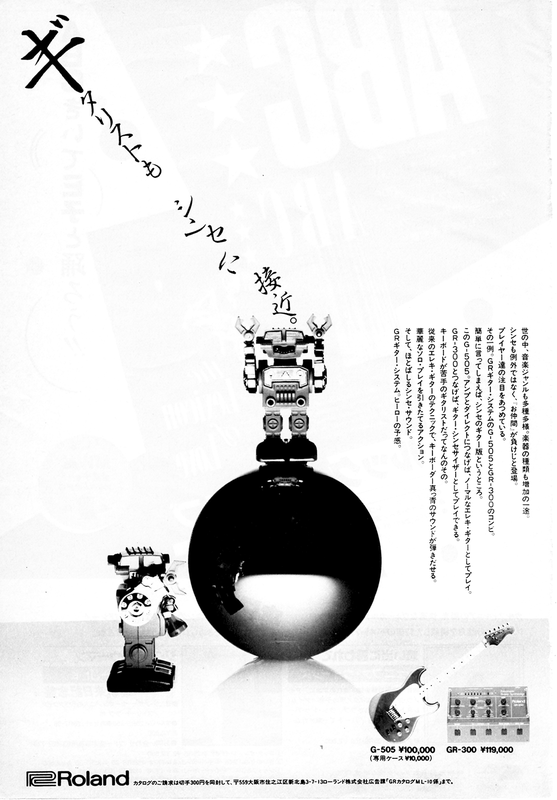 This can give you an inexhaustible number of sounds to play with since you are not locked in to any one manufacturer. An exciting new use is with MIDI programmable digital delays that automatically switch settings when you select another patch. As they say: the more, the merrier. Since some MIDI drum machines recognize a number of pitches to trigger each drum sound, using guitar strings to trigger drum machines all of a sudden becomes feasible. This can be used to actually program a drum box via rhythmic figures played on the GR-700, or to add a drum sound to a synth sound in tandem. Although a MIDI drum machine can recognize MIDI note numbers from the guitar controller and synth module, most MIDI drum machines will require the use of an external unit such as a dedicated or non-dedicated MIDI sequencer to "memorize" the drum patterns and rhythm that you generate from the guitar controller. As an example, the MIDI out of the GR-700 could be connected to the MIDI In jack of an MSQ-100 sequencer, and the MIDI Out jack of the sequencer could then be connected to the MIDI In jack of a TR-707. By putting the TR-707 on the same MIDI channel as the GR-700 you can record individual drum parts into the sequencer until you have a completed drum track. Many MIDI keyboardists have used this method when programming drum machines as it adds a genuine human feel to the sound of the drum part, as well as far more velocity than most drum machines are capable of producing. 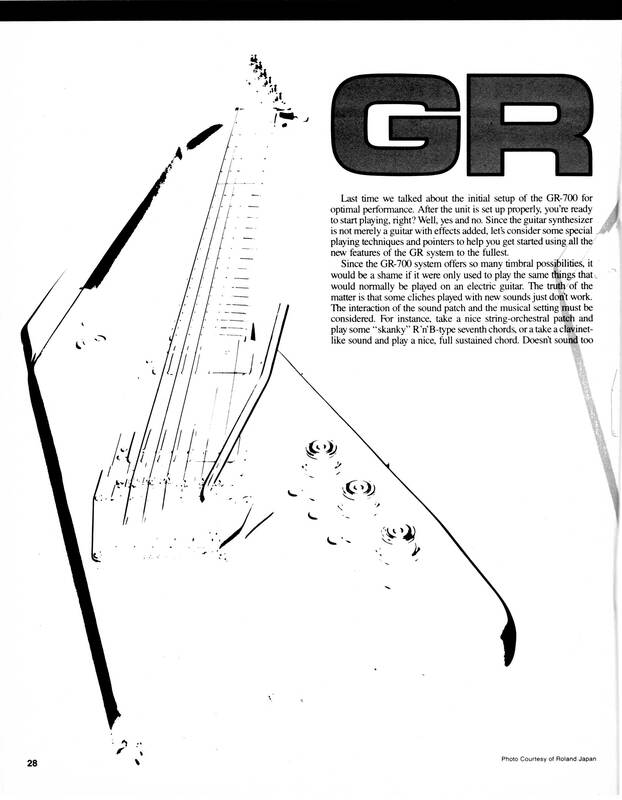 Perhaps the most exciting application that the GR-700 opens to the guitarist is the ability control and program MIDI sequencers and the new generation of computer software that "transcribes" a stream of MIDI notes into a format that you can edit and otherwise manipulate. The traditional problems of converting impromptu solos into musical notation can mostly be handled easily by the wonderfully interactive software now available, such as Roland's MPS. For instance, you could interface the GR- MIDI Out jack to the MIDI In of a sequencer such as the MSQ-IOO, the or to an MPU-401 MIDI Processing Unit connected to an Apple II3, Apple II Plus, Commodore 64, or IBM-PC. 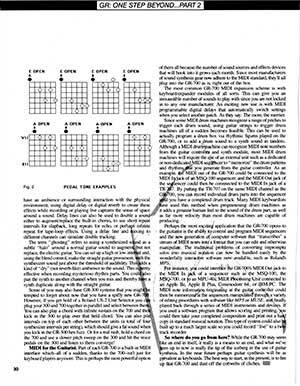 The MIDI note information originating at the guitar controller could then be memorized at the sequencers manipulated through a variety of editing procedures with software like MPS or MUSE, and finally played back through a series of MIDI instruments and devices. If you used a software program that allows scoring and printing, you could then take your completed composition and print out hard copy in standard musical notation. This type of system could also built up to a much larger scale so you could record "live" to a two-track recorder. So where do you go from here? 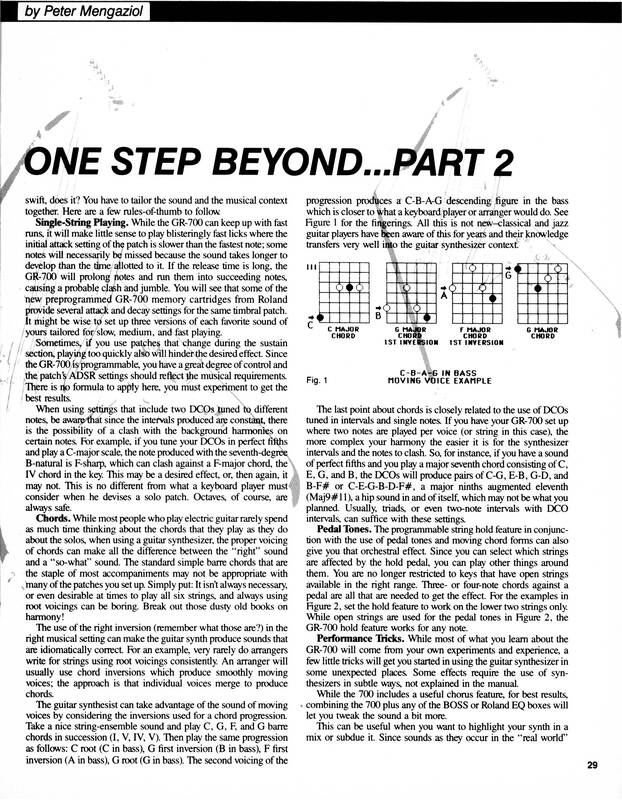 While the GR-7(00 may seem like an end in itself, it really is a means to an end, and what we've seen up to now is really the tip of the iceberg in the use of guitar synthesis. In the near future perhaps guitar synthesis will be as prevalent as keyboards. The best way to start, in the present, is to fire up that GR-700 and dust off the cobwebs of cliches.